In last tutorial we explained the theme header file. Now we will look at the footer file footer.php. We will skip some sections in the footer file, and get back to them when we discuss pop-ups. <section id="signup" data-type="background" data-speed="6" class="section-bg"
Here we will explain the footer code. Some of the code segments will not be explained: we will revisit them in later topics. 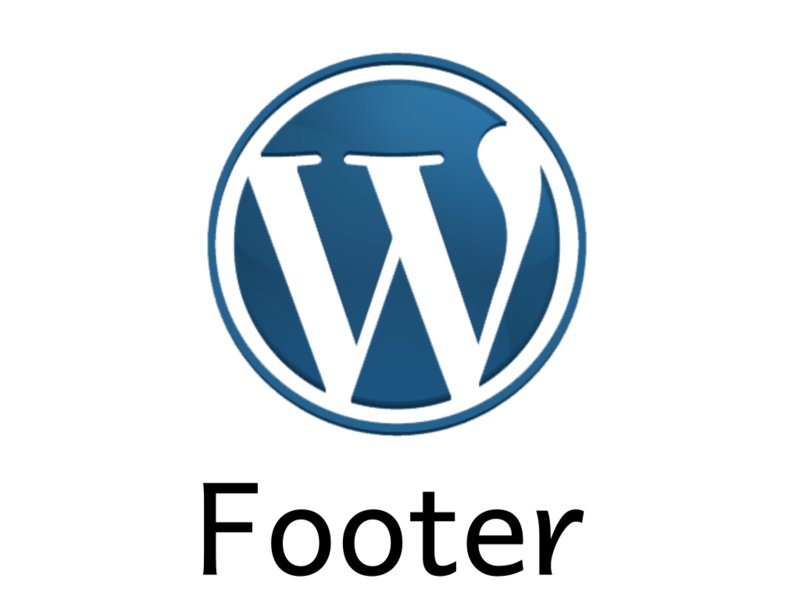 The function wp_footer() here inserts wordpress’ own footer code. This is where the visible footer section located. Similar to a header, the footer section contains links and other statements. The container for Bootstrap components. These “col-sm-x” classes specifie the footer into three columns, with the width ratio as 3:6:3 (See this post if you need to review using them). They are not included in the <div> tag with “row” class because there is one only row, and thus not necessary. Also don’t forget the closing tag </div>. We introduced Font Awesome in the header post as a great vector icon library. We talked about including the library in header.php. Now we see how we use them. class = "fa fa-lg fa-github"
“fa” means to use Font Awesome. “fa-lg” means to use a large size icon (33% larger than font size). “fa-github” means to use the Github icon. You can go to Font Awesome website and find other icons you want, along with sample HTML codes. 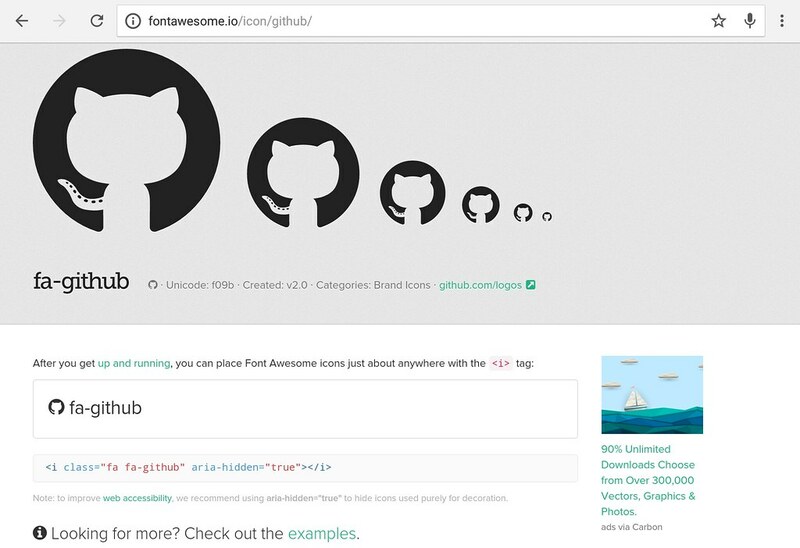 Font Awesome’s Github icon page. This is one of the tricky part of using wordpress and Bootstrap together. Since in wordpress we assign menus from the admin panel, we must use wordpress’ function to insert the menu into Bootstrap’s navbar. Hence the function wp_nav_menu(...). theme_location: specify the menu location in the theme (will expalin what this means later). container: the HTML tag that contains the menu. container class: the classes of the above mentioned HTML tag. menu_class: The menu is represented by the list <ul> tag, thus menu_class specifies the classes for the <ul> tag. HTML &copy prints out the special copyright symbol. See this page for the complete HTML symbol list. PHP function date('Y') prints out the current date. The 'Y' parameter tells the function to only return year. WordPress function bloginfo('name') prints out the website’s name. See its Codex page for printing other information of your wordpress site. If the source is external, we specify the “src” attribute to the external url like src="//ajax.googleapis.com/ajax/libs/jquery/2.1.1/jquery.min.js"
This script file is necessary for using Bootstrap. It works together with the Bootstrap <link> CSS file inclusion tag in wordpress header file.